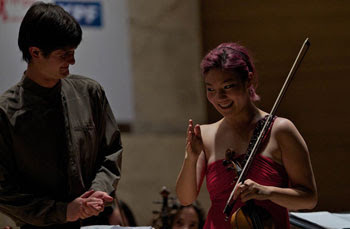 Jinjoo Cho (Corea) y Nigel Armstrong (EEUU), los jóvenes y talentosos artistas que resultaron ganadores del 1er y 2do Premio de la primera edición de Violín Buenos Aires 2010, continúan obteniendo galardones internacionales. Jinjoo Cho (Korea) and Nigel Armstrong (USA), the young and talented artists who were the First and Second Prize winners of the first edition of the International Violin Competition Buenos Aires 2010, continue receiving international awards. Jinjoo Cho, volvió a brillar en Corea, en el Concurso Internacional Isangyun 2011. Profeta en su tierra, Jinjoo obtuvo el 2do Premio de esta competencia realizada en la ciudad de Tongyeong. Este concurso para jóvenes músicos, se celebra anualmente durante los meses de octubre y noviembre, y es organizado por la Tongyeong International Music Festival Foundation, una de las instituciones de música más prestigiosas de Asia. Nigel Armstrong, en tanto, ganador del segundo Premio del Concurso Violín Buenos Aires 2010 y del Premio Tango, recibió el 4to Premio en dos competencias internacionales: en el XIV International Tchaikovsky Competition -que tiene lugar cada cuatro años en Rusia-, y en el Concurso Internacional Isangyun 2011, de la República de Corea. En Rusia, también con el Prize for the Best Performance of the Commissioned Work by John Corigliano. Y no fueron las únicas distinciones de este joven, cuyo virtuosismo se destaca en el universo del violín: la revista Musical America, acaba de nombrarlo en su última edición, Mejor Artista Joven del Mes. ¡Felicitaciones! Jinjoo Cho shone in Korea once again, at the International Competition Isangyun 2011. A prophet in her own land, Jinjoo got the Second Prize in this competition, which took place in the city of Tongyeong. This contest for young musicians takes place every year in October and November, and is organized by the Tongyeong International Music Festival Foundation, one of the most prestigious music institutions in Asia. Nigel Armstrong, recipient of the second Prize of the International Violin Competition Buenos Aires 2010 and of the Tango Prize, got Fourth Prize in two international competitions: at the XIV International Tchaikovsky Competition - which takes place every four years in Russia - and at the International Competition Isangyun 2011 - at the Republic of Korea. In Russia he also won the Prize for the Best Performance of the Commissioned Work by John Corigliano. And these were not the only distinctions this young man received, whose virtuosity stands out in the world of violin: the magazine Musical America named him Best Young Artist of the Month in its latest edition. Congratulations!